The following guest post is from NFCA volunteer Annette Marie of Best Life Gluten-Free. Here we go! Make this for the whole family, those who are gluten-free as well as everyone else: Gluten-Free Corned Beef and Cabbage Dinner! 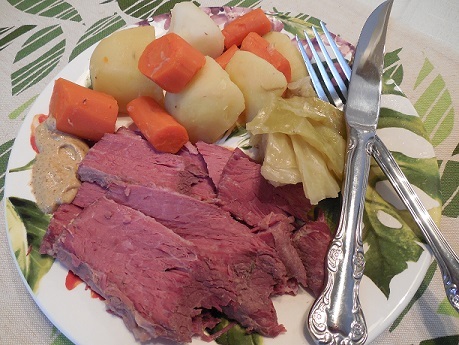 Here in the USA, we typically see Corned Beef Brisket sold in supermarkets just around St. Patrick’s Day, but some specialty markets will carry it all year round. So, if you’re spotting it during May or September, grab it & know you’re a lucky one! Make this dinner and savor the flavors many times over and over. It’s easy to prepare, don’t be intimidated by the time element. It mostly does all the work while it’s simmering along. Let’s get you started. Make this dish and get ready for the compliments! 2 garlic cloves, peeled and smashed. Water, enough to to cover meat well. Remove meat from packaging and briefly rinse under water . Take a large pot or Dutch oven and place meat inside. Add enough water to cover it well. Don’t skimp on the water, since it will be simmering for a long time. Cover it by approximately 2 inches. Throw in (well, not literally,) the bay leaf, parsley, salt, peppercorns and thyme. Cover and bring to a boil. When you see it’s come to a boil, lower heat and simmer for 2 hrs. Occasionally, check to be sure it’s simmering on a light boil and after 1 hour, using 2 large spatulas or spider tool, gently turn over to reverse side. Be gentle. It’s getting very soft. After 2 hours, stick a fork or knife in the meat and it should be very tender and pierce right through. Using that spider tool or spatulas, remove to a large platter and cover meat with foil. Re-position meat into the pot for another 15 minutes to reheat. Remove meat to a carving board and slice to the thickness you prefer. Serve on a large platter with the veggies along-side and provide your favorite type of mustard to accompany each bite. You can drizzle a little of the broth on top of the slices if you like. So good. Get ready for the compliments!